I wore my costume to work and the next day to another halloween party. The inspiration was loosely based on The Lizard from SpiderMan. The costume is home-made, so to speak, or put together from different pieces. 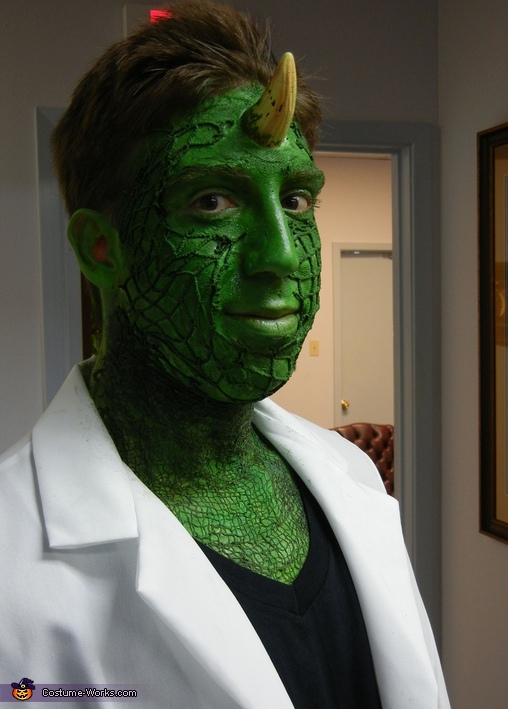 I obtained the idea to use fishnet as scales from this web site and used larger sized diamond fishnet for my face and green mesh netting that was supposed to be a different halloween prop for my chest and hands. The basic application of it is just liquid latex. I bought the Horn and glued it on. I used a base light green first and after applying the "scales" added another layer of a darker green, so the scales would not be just black. The Lab coat was purchased from a medical supply shop. The tail was a snake that I tucked into my belt. It took about 2 hours to do all the makeup which I did by myself.